Boil milk in non stick wide pan in medium high flame. Stir frequently and let it boil for 8 minutes. Now, add water to lemonjuice and mix well. Add lemon water juice to milk when it boils well. Now, fat separates from the milk and let it boil for 3 minutes. Place the cheese cloth in strainer and drain out the paneer. Run cold water in to paneer to remove the flavour of lemon. Then squeeze out water from paneer gently. Hang out the paneer for about half an hour to one hour. Now,our paneer is ready to go. This is most important step in this process. Knead the paneer well with the palm. Rub it well and make it as soft dough. The paneer has to be really soft. so knead it really well. Make in to equal portions and roll in to balls. The paneer balls may broken if it is not soft or not kneaded well. So, do knead gently to get smooth dough of paneer. 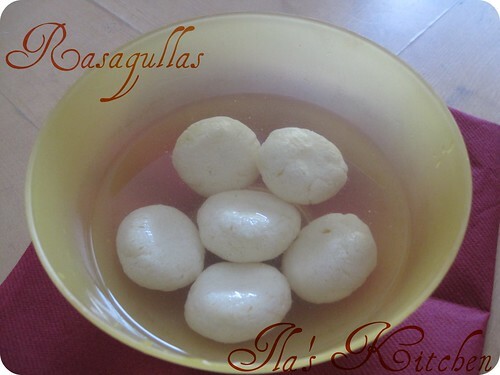 Now, our paneer balls are ready to do rasagulla. Heat the water in a wide pan and let it boil well. Add sugar when water boils and let it dissolve. Now add paneer balls in the sugar syrup and cover the pan. Let it be for 10 minutes in medium flame. Open the pan and turn the paneer balls to other side and cover it. Let it be for 15 minutes and then remove from heat. Just let it for 10 minutes and then open the pan. Make sure to use wide pan coz paneer balls will become double in size. Just check the texture and size of balls and let it cool. Now, our rasagulla is ready to serve. Boil the milk in non stick pan in medium high flame. Let it boil for 25 minutes and milk reduced to 2 cups. In the mean time, take rasagullas and squeeze syrup from it gently. Squeeze really gently and keep it aside. Now,add sugar and cardomom powder to the milk. Now add rasagullas in milk and let it boil for 4 minutes. Now transfer rasamalai in a bowl and refrigerate it. Serve rasamalai really chill with almonds,pista and saffron. This yummy and delicious Rasamalai can be served with meals as dessert. 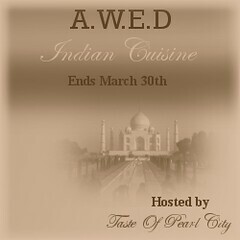 I am sending this recipe to A.W.E.D.Indian Cuisine Event hosted by Umm and originated by DK. Thats a fantastic demo of 3 steps .. looks very yummy .. well explained n perfectly demonstrated..
Ras malai looks oh so temting feeling like eating it right now !! Delicious rasmalai...perfect for a party. Wow the Rasmalai looks super delicious and perfect.A perfect way to end a meal. 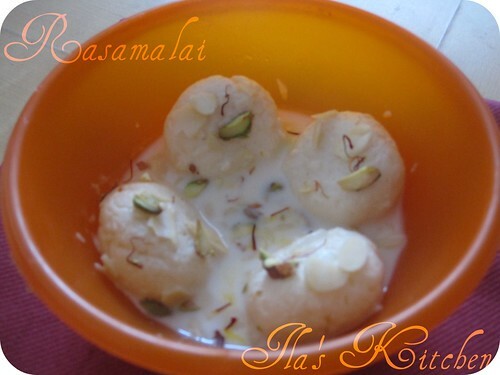 Fantastic n drool worthy tempting rasmalai...lovely! Rasmalai looks superb !!! Very tempting and yummy !! wow rosmalai.....one of my favorites dear !loved it ! 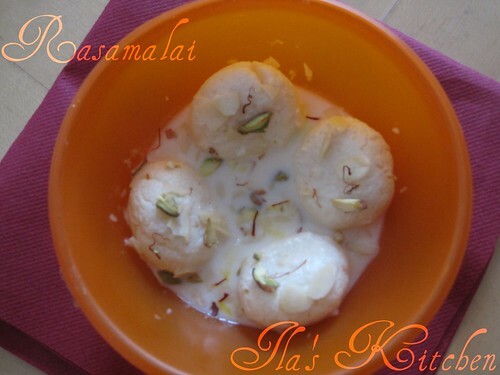 Hai Ila nice to see ur comment.Rasmalai is very inviting makes me drooling.Happy to follow u.
Rasmalais look perfect. I love Manjulajis recipes, they always turn out excellent. I love tis recipe too..perfectly recreated..Looks FAB!! That's a perfectly marvelous rasmalai! Oh, I'm sooo tempted to taste it! Rasmalai is looking delicious...simply irresistible. Ras malai looks awesome.Picture looks so inviting.Your collection of recipes are so nice.Thanks for your wonderful words in my blog. You know when I was getting married, my dad asked me what I would like in the menu for my haldi ceremony. Guess what my answer was! Rasmalai! Looks yum. delicious rasmalai,thanks dear for visting my space and giving your valuable feedback..
Rasmalai looks so spongy and lovely. This looks too tempting Ila!!! The rasmalais have out perfect & spongy!! Fabulous!! looks gorgeous ...must have tasted divine dear.. I love rasamalai very much. Looks delicious and mouth watering. Wonderful presentation. Ila thanks for visting my blog & your lovely comment.I am following your blog and what a start-I am no different from others when it comes to rasmalai:) You have done an excellent recipe and it looks absolutely sweet & spongy and mmm.mmm...mmmmmLook forward to more exciting recipes from you:)Happy blogging !!! Wow thats a yummy desert!!! This is my first time here. you have a really nice space. love ur dishes.. this is my fav sweet.. your is fantastic.. very tempting and nicely presented.. yummmy,,, glad to follow ur blog. This one looks really irresistible. Thanks for all the sweet comments on my blog. There is an award for you. Please accept it. Ila, your ghee rice looks fantastic and flavorful. But the post a comment link is not coming up in that page, please check it out dear. This was an schoker to me, It was awesome taste and I could not recollect having a delicious sweets like this.